It took me six months to pronounce Wrocław properly. I still have to think about it. Polish does not roll easily off my tongue. I came here for the first time in April, 2013. While attending Pen Show Poland in Katowice, the people spoke of a magical, beautiful city – Ruffwuff. Apparently, a city for dogs. Hey, is that near GrrGrr and (panting)? Someone wrote it down for me, and I, the Authoritative American, blurted, “Oh, you mean ROCK LAW!” No, Wuffwuff. Ruffwuff. Woofwoofwuffwuff. I went back to California and couldn’t tell my friends where I’d been. By the way, Katowice is pronounced Kah-to-VEE-tseh. 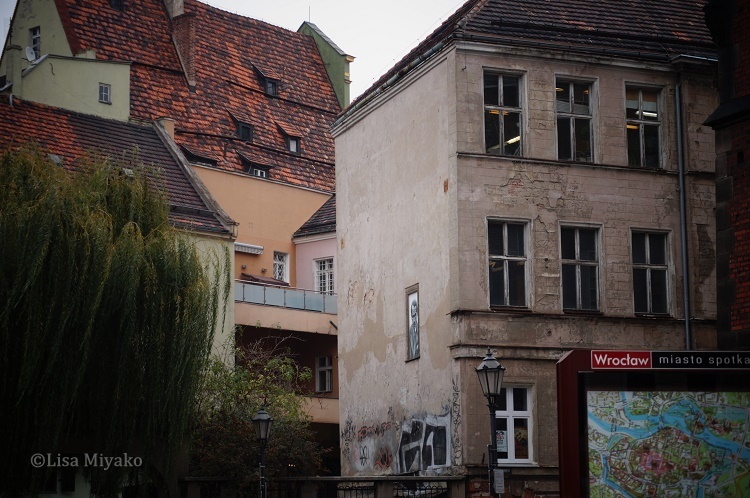 Nie ma za co.
Posted on 2015-01-11 2015-06-22 by ethernautrix	This entry was posted in Photography, Po Polsku, Wrocław and tagged Stare Miasto. Bookmark the permalink.